A revolutionary new technology of French Fries ! On behalf of HTF we would like to thank all the people that came to visit our booth during Anuga 2015 Exhibition ! It was a pleasure having you with us and showing you the advanced features of our NEW ground breaking Hi-Tech Fries technology . We hope you were pleased with what you saw and we invite you to contact us should you require further information. With our innovative and revolutionary production process, we can deliver to you a product that is both healthier and lower in cost than the usual par fried frozen French fries. 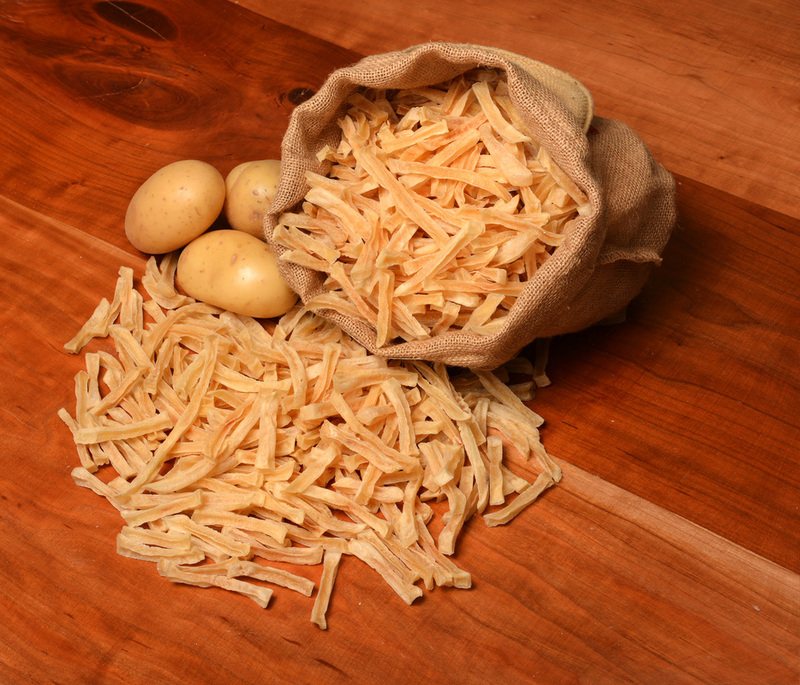 The major steps of the process include cutting the farm fresh potatoes to a shoestring size of 3/8"x3/8" natural length, which are then dehydrated and packaged for shipping. There is no need for refrigeration of the product at this stage, HTF can be shipped and stored at ambient room temperature for up to 2 years. The final preparation of the product by the consumer entails rehydration of the sticks by soaking in water (either plain or spiced and flavored) for 2-10 hours followed by an extremely short frying period of up to 1minute and 20 seconds. Outstandingly delicious and amazingly crunchy product due to high solid content in the Hi-Tech Fries. Cost effective, lower price per Lb. or Kg. than frozen products. No freezing required. No need for special handling and storage requirements. Eliminates the need for costly frozen shipping and handling. Provides a convenient solution in facilities with no frozen storage capabilities. A flexible rehydration stage. Immersion time can be changed according to your needs. Prepare only the amount you need when you need it. Only a single, short frying time of only up to 1 min and 20 sec. compared to the two frying steps that are used in processing frozen French fries. Reduced fat, including saturated fat of up to 30-40%, and calorie content compared to par fried products. Substantially lower acrylamide levels, up to a total of only 150 microgram/Kg., compared to other brand name frozen French fries. Can be also produced as a delicious snack in a unique process. No additives or processing aids are added. The product contains only potatoes and oil. Organic, Natural and Non GMO options available. 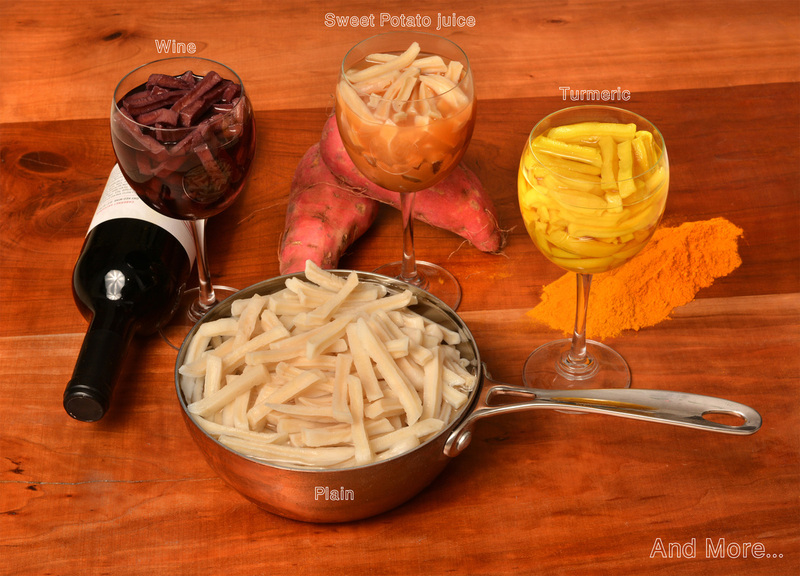 Whether for home or food service use, HTF offers a healthier and easier method of preparing French fries.